Computers in Libraries 2013 shares how leading edge libraries and information services are evolving, managing and excelling. Join us April 8-10 at the Hilton Washington to get lots of ideas and insights for jumpstarting your evolution strategies. Applause for Information Advisor editor Robert Berkman ... READ MORE! In 1842, the Illustrated London News (the world's first illustrated weekly newspaper) rolled off the presses, the University of Notre Dame was founded, and Karl Marx became editor-in-chief of Rheinische Zeitung. Much has happened around the world since the 1840s, and the Springer Book Archives (SBA) is capturing and chronicling the historic print highlights that have happened since then. This new online book collection from Springer Business+Science Media, which officially debuted days ago at ALA Midwinter, represents Springer's ongoing commitment to the scientific research community by digitizing about 100,000 books dating from the 1840s. SBA's first release of 37,000 English-language books, many of which were previously out of print, went live in late January, and more than 63,000 other titles will be released throughout 2013. OCLC and Gale, part of Cengage Learning, agreed to make all Gale databases and archives fully discoverable through WorldCat Local and to explore broadening discoverability of Gale collections through other applications available through the OCLC WorldShare Platform. OCLC and Gale have been offering access to some of Gale's most popular databases to mutual subscribers through the WorldCat Local discovery and delivery service. This new agreement will enable OCLC to index metadata and full text for all Gale databases and scholarly archives. Ingram Content Group, Inc. announced that it has added a new content access model to its MyiLibrary econtent platform to provide libraries greater flexibility in ebook lending. MyiLibrary's newest model, its Access Model, enables libraries to purchase a set of access credits for an ebook and lend it simultaneously to multiple patrons for a set cost and lending period. For libraries, the model can easily eliminate turnaways due to concurrent use and provides libraries with a relevant tool to make the most out of high usage titles. The Access Model is compatible with MyiLibrary's other acquisition models including Perpetuity, Patron Selection, and Short-Term Loan. ProQuest unveiled its new ProQuest Congressional, which has been rebuilt with an all-new technological framework that supports richer, more in-depth exploration, and expanded use of its unique content. Acquired by ProQuest in late 2010 from LexisNexis, the one-of-a-kind service captures the breadth of governmental output, providing users with efficient, targeted access to the most comprehensive collection of historic and current congressional information available anywhere online. 2012 was quite an intense and turbulent year—wilder weather, the London Olympics (and a gymnastics gold for Gabby Douglas), the contentious U.S. Presidential election, Facebook's disastrous IPO, the iPhone 5, the iPad Mini, patent lawsuits, and, as we neared the end of 2012, the "Fiscal Cliff." And drat, that was too close for comfort. Over the past year, the most-read news article on the infotoday.com site was my NewsLink Spotlight article posted Dec. 3, 2012, "The Fight for a Free and Open Internet." It clearly touched a nerve. 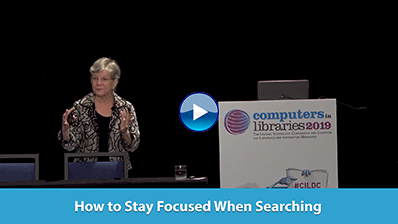 Super-Searcher Mary Ellen Bates of Bates Information Services explains how to separate the incidental from the integral in search in this clip from her presentation at Computers in Libraries 2019. CLOSED CAPTIONING IS NOW AVAILABLE. This evocative historical novel tells the story of Giacinto, who emigrates from Italy in 1912 and becomes a carousel carver during the golden age of the craft in America, and Rosa, the eight-year-old orphan girl thrust into his care. The Carousel Carver vividly recreates the world of the immigrant carvers—from the inspiration found in fiery horses, big cats, and children's laughter to the clatter, sawdust, and politics of Philadelphia's bustling multicultural workshops. This is an engaging and insightful tale of tolerance, second chances, and what it means for those once adrift to call America home. The ebook is available from Amazon, Barnes & Noble, and Kobo. ITI Conference Blog – libconf.com – covering ITI's library conferences worldwide. ILI365/InfoToday Europe Blog – infotoday.eu – news and ideas for, and by, innovative info pros from around the world, throughout the year. Streaming Media Blog – www.streamingmedia.com/Articles/Blog – the go-to destination for opinion, analysis, and insights into the entire online video ecosystem, from glass to glass. This newsletter is published by Information Today, Inc.